It’s been a long time coming in fact 13 months between releases for Affiliate Page Pro. Now at version 3 this software that creates great affiliate tools pages that integrate email capture for your affiliates, just got even better. I initially created this software with Paul Kleinmeulman another Aussie internet marketer, and since then have rewritten the software from the ground up and now have introduced the ability to offer a free trial, just like all my other software. This release brings the software up-to-date with the new Adobe AIR releases that have happened over the last 18 months. 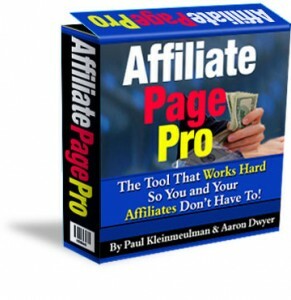 Since this is a new version Affiliate Page Pro 3 will install separately. You can uninstall the old Affiliate Page Pro 2 version at any stage. You can’t obviously upgrade while running Affiliate Page Pro 2 using the inbuilt upgrader. So simply go to the download page (emailed to you) and install the new version. This release will pave the way for any new features added in the future.